The physicist Shevek flees his native Anarres, an independent planet settled by former citizens of Urras, in order to continue his work on the ‘theory of the General Field in temporal physics’ (p. 283) having elicited little interest in his endeavours on his isolationist home planet: “I must explain to you why I have come to you, and why I came to this world also. I came for the idea. For the sake of the idea. To learn, to teach, to share in the idea. On Anarres, you see, we have cut ourselves off. We don’t talk with other people, the rest of humanity. I could not finish my work there. And if I had been able to finish it, they did not want it, they saw no use in it. So I came here.” (p. 284). In contrast, Shevek is enthusiastically received on Urras as consequence of the fact that it is anticipated that he will make a significant scientific breakthrough whilst residing there, and that the Urrasti will subsequently be able to capitalize upon it: ‘if you provide the theory, the unification of Sequency and Simultaneity in a general field theory of time, then we’ll design the ships. And arrive on Terra, or Hain, or the next galaxy, in the instant we leave Urras!’ (pp. 73-74). After long periods of inactivity and distraction, Shevek does finally make significant progress with his work. Rather bravely, considering the suspension of disbelief required in the reader, Le Guin chooses to describe the physicist's moment of revelation, wisely choosing to focus on his self-observed response to the discovery: ‘the fundamental unity of the Sequency and Simultaneity points of view became plain; the concept of interval served to connect the static and the dynamic aspects of the universe[…] The moment was gone; he saw it going. He did not try to hold on to it. He knew he was part of it, not it of him. He was in its keeping’ (pp. 231-32). It emerges that the Urrasti political underground admire Anarres as ‘an experiment in non-authoritarian communism that […] has survived for a hundred and seventy years’ (p. 282). At a council meeting, one of the Urrasti revolutionaries recounts some of the teaching of the founding mother of Anarres society, Odo: ‘“For we each of us deserve everything, every luxury that was ever piled in the tombs of the dead Kings, and we each of us deserve nothing, not a mouthful of bread in hunger. Have we not eaten while another starved? Will you punish us for that? Will you reward us for the virtue of starving while others ate? No man earns punishment, no man earns reward. Free your mind of deserving, of the idea of earning, and you will begin to be able to think”. They were of course Odo’s words from the Prison Letters, but spoken in the weak, hoarse voice they made a strange effect, as if the man were working them out word by word himself.’ (p. 295). 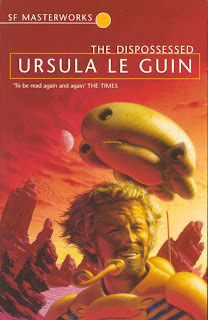 Ursula Le Guin’s ambitious, Nebula-winning meditation on political, social, economic and personal arrangements is most commonly referred to as The Dispossessed, with its frank subtitle (‘An Ambiguous Utopia’) seldom being acknowledged. That the implied theoretical value to the reader of this much-discussed work should be so starkly undermined by its author prior to their even having begun to read it explodes for me the idea that Le Guin was seriously interested in presenting a compelling fictive account of alternative social structures. However, this has not stopped professional literary critics and exponents of the soft sciences championing their interpretations of the work’s various themes in support of disparate theoretical agendas. I remain unconvinced by the work’s utopian elements, and ambivalent about its ambiguities. It is nevertheless an engaging addition to the SF Masterworks library.